A Van de Graaff generator is an electrostatic machine. It uses a moving, nonmetallic belt to accumulate very high voltages on a hollow metal globe. 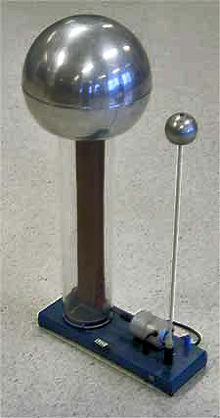 Voltage differences achieved in modern Van de Graaff generators can reach 5 megavolts. Applications for these high voltage generators include driving X-ray tubes, accelerating electrons to sterilize food and process materials, and accelerating protons for nuclear physics experiments. The Van de Graaff generator can be thought of as a constant-current source connected in parallel with a capacitor and a very large electrical resistance. It is named after the American physicist Robert Jemison Van de Graaff, who built the first generators of this style in 1929. This page was last changed on 17 February 2019, at 10:54.